Michael McFadyen's Scuba Diving - Magic Point Sharks In the late 1950s and early 1960s, the pioneer spearfishers and scuba divers found a new sport that promoted their bravery. This was the killing of sharks using powerheads. Spearfishing/scuba magazines of that time have articles about (now) well known divers going to places in New South Wales like Seal Rocks and South West Rocks and killing sharks by the dozens. Of course, what we now know is that these sharks were grey nurse sharks, a totally benign and harmless species and that it did not take much bravado to kill these slow moving fish. Note that Dave Ireland, a well known diver/former shop owner emailed me in early March 2002 disputing my claim they are harmless. However, in all the cases that he mentioned where people were bitten or threatened, they had provoked the shark by feeding it, grabbing it, having a dead fish strapped to them or by shining bright lights in its eyes at night - the time when they normally feed. 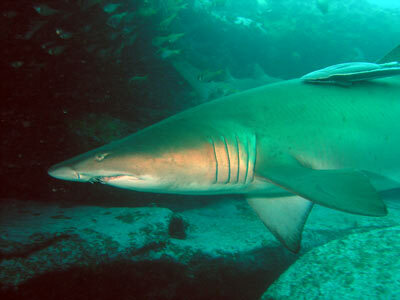 There is no recorded case of unprovoked attack by a grey nurse shark. 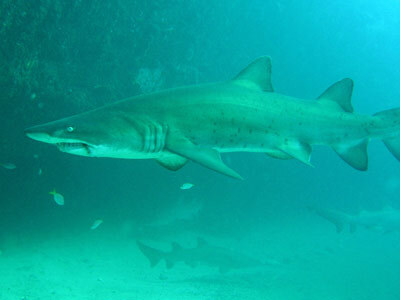 Anyway, at this same time, there were populations of grey nurse sharks in the Sydney area. These included Jibbon Bombora and The Appartments (Long Reef). 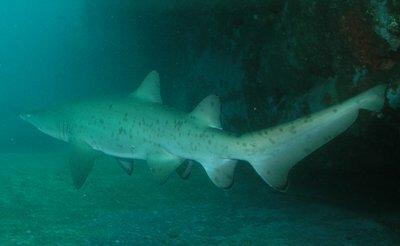 After the early 1960s, there were virtually no fulltime and regular popluations of grey nurse sharks to be found in Sydney. 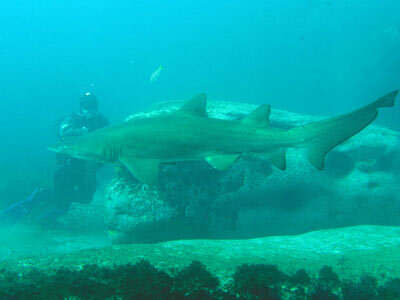 Dave Ireland used to feed grey nurse sharks at Jibbon from about 1978 till 1985. He told me that the population arrived about October and left around March and numbered around seven. The Long Reef population finished about 1984 and the ones at Boat Harbour at Kurnell disappeared about 1990. Since then, one or two have been seen in a couple of locations, Jibbon Bombora, Bare Island, Marley Point or The Appartments. However, these were never around for long and soon moved on. In 2001 I saw some on the SS Tuggerah and in 2006 one at Kurnell. 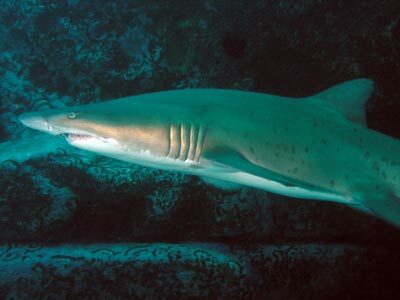 In late 1998, a population of grey nurse sharks was found in Sydney by a couple of spearfishers. I was told that there was only a couple there (maybe three) and I am not sure how long they were there for. In late January or early February 2000 it became known that the sharks were back, this time in even larger numbers. I think they were first seen again in November 1999. South Maroubra is a spot that I grew up around. In the early 1970s I was a junior lifesaver at South Maroubra and I spent most weekends and during school holidays, most weekdays, on Maroubra and South Maroubra Beaches. Since I started diving I have dived numerous times at South Maroubra and the wreck of the SS Belbowrie. Once, in an unsuccesful search for the remains of the SS Tekapo, I dived right on Magic Point, the far point of South Maroubra. This is only a few metres from this location. 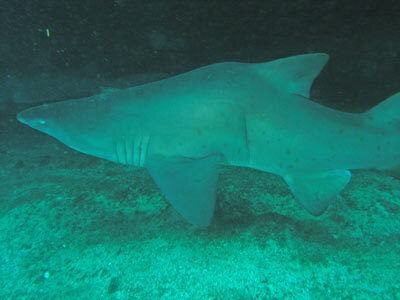 During all these dives, I never encountered any grey nurse sharks in this area. 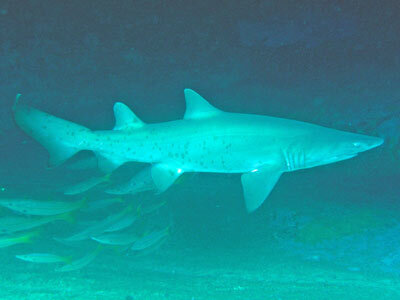 As I indicated, in early 2000 a population of grey nurse sharks was found near the end of Magic Point. Who knows how long they had been there before being discovered? The only way to get there at first was by private boat but now every dive charter boat and his dog goes there (even in 2008). Note that the charter boats do not appear to liaise with each other about who dives here and when, so it is possible to end up in the water with over 50 divers if the larger boats arrive at the same time. The operators do not even consider staggering their dives or setting up a roster of which boats are visiting. Even when they arrive and there are already 20 or 30 divers in the water, they still dump their own divers in without waiting for the ones already in the water to exit. Pathetic! Consider that when the Scuba Clubs' Association of NSW (SCAN) holds its biannual dive day at Frenchmans Bay in Botany Bay we specifically agree that none of the Clubs' boats will go to Magic Point so that there are no large influxes of divers. If using your own boat, the easiest place to start from is Botany Bay. Head out of the Bay and turn north. Travel past Long Bay and the wreck of the MV Malabar, past Long Bay Rifle Range (and the Red Flag dive site) till you can see Maroubra Beach. The point on your left is Magic Point and the dive site is not too far towards the beach. GPS readings are 33° 57' 29"S 151° 15' 51"E (using AUS66 as datum - see my GPS Page for more info). Line up the blue roofed house to the west over the cliff edge and to the north, line up the microwave tower at Bondi Junction over top of the eastern most cream/white block of units at North Maroubra. Run in towards the rocks and the depth will rise from 20 metres to 15 metres and then 8 metres. Depending on the wind, anchor on the top (in southerly or south-easterl/westerly winds) or in the deeper water in northerly winds. A wall runs east/west here and the sharks live in a cave on this wall, albeit on a small section that runs north-south. To the west, the wall peters out a bit and to the east it runs north/south for a bit before turning to the south-east. There is another large overhang about 30 metres to the south-east of the main cave. Anchoring as indicated will put you within metres of the sharks' location. The depth of the cave is about 15 metres and the cave extends for 15 metres and is about 5 metres deep at the western end. Once on the bottom, head to the cave and stop about five metres in front of the cave. This is on the cleared area just in front of the kelp. The sharks will be seen milling around in and out of the cave. They move from inside the cave to the outside and sometimes they swim away from the cave on short jaunts. 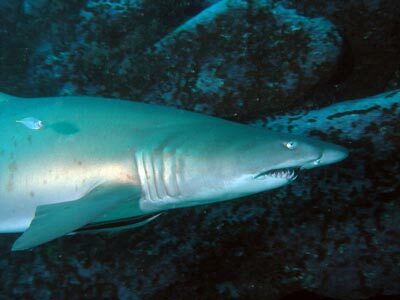 The sharks are accompanied by enormous schools of yellowtail as well as suckerfish (remoras) and pilot fish of different species. So far I have visited this location in excess of 15 times and until recently we have seen between 4 and 18 sharks on each dive. See the table at bottom for dates of dives and numbers seen. 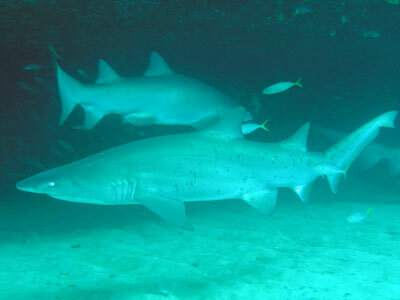 The cave seems to be the home to female grey nurse sharks, up to 10 or even 15 at some times. None of them are huge but a couple are large. Most are small and on all but one dive, we have seen one or more very small females (say one metre). 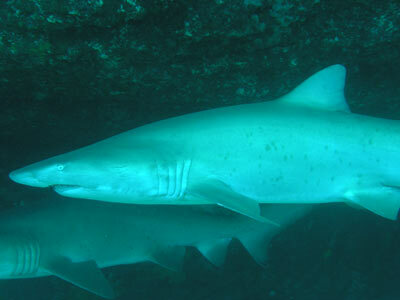 There have been reports of more than 20 sharks here and on 13 July 2008 I saw 12 in the main cave. I have only seen males here twice, including in May 2002 when there were at least 5 in this cave. On 9 February 2003 after at least six charter boats dived at least 55 divers here in about 90 minutes, I only found four sharks. This was the lowest number I had recorded here in all my dives. Since then I have seen four and one and I have been advised by other divers that many times in 2003 and 2004 there were none at all. In my view, certain dive charter boats have killed this site, taking too many divers and too inexperienced divers and scaring the sharks away. This is a view I have made to State Fisheries as well. These charter operators need to either create a strict roster for visiting the sharks, severely limited the number of divers that they take there and perhaps they might recover to the 2000 and 2001 numbers. Note that in mid to late 2000s the numbers have come up a bit to 26 in July 2008. 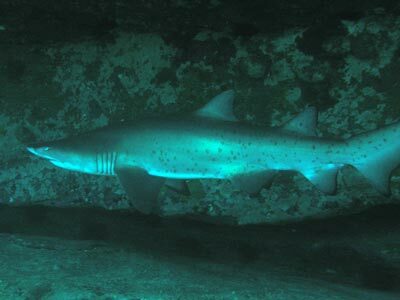 In the cave/overhang to the south-east, we had sometimes seen up to three grey nurse sharks. On the first dives one was a very small, skinny and very unhealthy looking male and another small male. On my third dive here the males were not seen, but two females were in this cave and another was about 20 metres further along. This was probably the very small one seen on a previous dive and since seen a number of times. On one dive the skinny male was seen in the main cave. On my 3rd, 4th, 7th and 12th dives I used a scooter to explore the area to the east and found no more sharks except the three mentioned above. I went about 100 metres at a depth of 10 to 17 metres. I have also explore to the west about 100 metres and found none. In July 2008 there were 14 sharks in and around this cave, compared to only 12 in and around the main cave. Apart from the sharks, there are some giant cuttlefish, including a very aggressive one when I first dived there, sea dragons galore, giant rays and huge schools of yellowtail. Visibility on my dives here has been between 15 and 20 metres. We never do a full dive here, we normally drop in on the way back from another dive further north (like Shark Point or Wedding Cake Island). We use the remaining air from the first dive as you really only need about 20 to 25 minutes here to seen everything. This is a great dive site, one of the best in Sydney and certainly a unique location outside Forster, Seal Rocks, South West Rocks and the Solitary Islands. Fantastic. Shot Saturday 25 June 2011. Video taken 25 August 2012 using a GoPro. More photos of sharks at Magic Point, 25 June 2011.